To assess the usefulness of optical coherence tomography angiography (OCTA) in cases of idiopathic choroidal neovascularization (iCNV). Seven eyes with suspected iCNV were evaluated using OCT, OCTA, fluorescein angiography (FA), and indocyanine green angiography (ICGA) and were followed up between 3 weeks and 4 weeks following an intravitreal anti-vascular endothelial growth factor (VEGF) injection. The utility of OCTA in the diagnosis and characterization of morphology of iCNV at baseline and follow-up was assessed. Morphology of vasculature comprising iCNV could be detected in all cases (100%) on OCTA and in 57% cases on ICGA. FA only detected hyperfluorescence and not individual vessel morphology. After anti-VEGF injection, the mean logMAR visual acuity improved from 0.55 to 0.27. A qualitative scale to assess response of therapy is suggested. 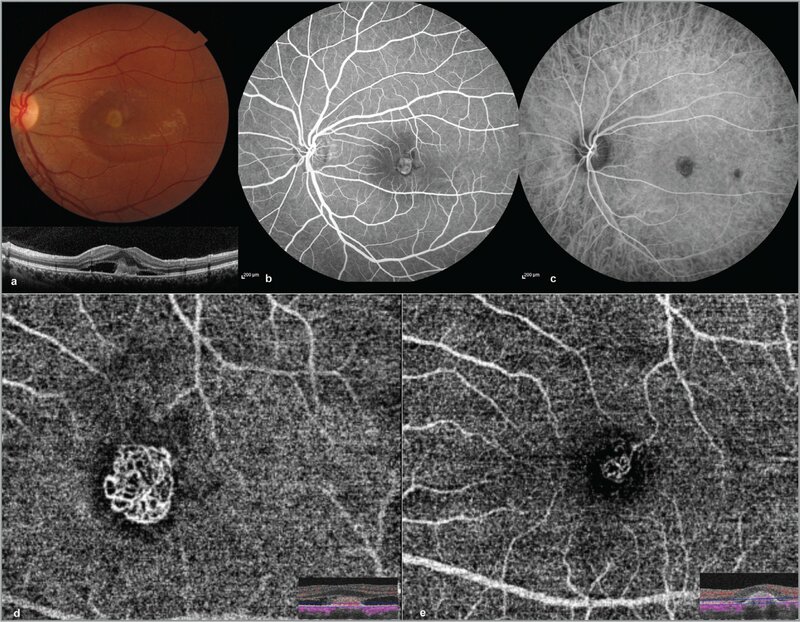 OCTA is a useful, noninvasive tool to detect, characterize, and follow-up on cases of suspected iCNV with utility comparable to or even better than traditional angiography techniques. Optical coherence tomography angiography (OCTA) is a novel and innovative application of existing optical coherence tomography (OCT) technology for mapping the retinal and choroidal vasculature. It is a dyeless angiography technique with the potential to replace conventional fluorescein angiography (FA) and indocyanine green angiography (ICGA) for diagnosis and overall management of retinal vascular disorders. Several studies1,2 done to evaluate the role of OCTA in the diagnosis of choroidal neovascularization (CNV) have found it to have a high sensitivity and specificity. The role of OCTA in the post-treatment follow-up of CNV in cases of age-related macular degeneration (AMD) has been widely evaluated, and the results are extremely encouraging.3,4 However, there are only a few studies on its application in cases of idiopathic CNV. We compared the imaging of idiopathic CNV using FA, ICGA, and OCTA. The utility of OCTA in follow-up of these patients following treatment with anti-vascular endothelial growth factor (VEGF) therapy was also evaluated. The study adheres to the ethical principles of the Declaration of Helsinki. Approval was taken from our institutional review board for this study. A retrospective analysis of multimodal imaging characteristics and response to therapy of cases of idiopathic choroidal neovascularization (iCNV) was performed. We evaluated seven eyes of seven patients with suspected iCNV with swept-source OCTA (SS-OCTA) (DRI OCT Triton; Topcon, Tokyo, Japan). At presentation, a comparison of the features seen on OCTA was done with FA and ICGA using the Spectralis HRA+OCT (Heidelberg Engineering, Heidelberg, Germany) with the Heidelberg Eye Explorer software platform. OCT scans were performed using the Triton or the Spectralis. The OCTA and OCT scans were repeated at follow-up visits scheduled between 3 weeks and 4 weeks following an intravitreal anti-VEGF drug. Primary outcome measure was the utility of OCTA in the detection of CNV in cases where a diagnosis of CNV was suspected clinically and further confirmed on FA and ICGA. Secondary outcome measures were a comparison of CNV features seen on OCTA and ICGA and changes in CNV characteristics on OCTA on follow-up. Change in morphology of CNV seen on OCTA was graded as marked resolution (if the network of individual vessels is not identifiable [highly fragmented] at follow-up with a visually significant reduction in size of the CNV [> 50% reduction] on OCTA), moderate resolution (if the network of vessels is still identifiable but there is a visually significant reduction in size of the CNV [>50% reduction] on OCTA), and mild resolution (if the network of vessels is almost same with no or minimal reduction [< 50% reduction] in size of the CNV on OCTA). The greatest linear dimension of the network of vessels seen on OCTA or the area of the network was not compared as the automated measurement techniques of the above are not standardized and manually outlining and measuring the smaller vessels appears to be a very subjective technique. Seven eyes of seven patients were included. The mean age of the patients was 32.1 years. Male to female ratio was 1:6, Mean logMAR visual acuity (VA) was 0.55 with a standard deviation of 0.42. The refractive error of our patients ranged from 0 diopters (D) to −1D with a mean refractive error of −0.4D. CNV was suspected due to the presence of a subretinal hemorrhage and / or presence of a grey / cream colored discoloration at the macula. These were classified as having idiopathic neovascularization after excluding other causes of CNV such as trauma, associated choroiditis, macular dystrophies, high myopia, parafoveal telangiectasia, histoplasmosis, angioid streaks, and age older than 50 years. OCT showed an area of hyperreflectivity in the deep retina in all cases. Subretinal fluid (SRF) was seen in five cases; intraretinal fluid (IRF) was not found in any case. FA showed a patch of hyperfluorescence corresponding to the grey / cream area on the fundus from early phase increasing with time in all cases. However, it failed to show the actual morphology of the CNV. ICGA showed a network of abnormal vessels in four of seven eyes. In three of seven eyes, it only showed a patch of diffuse hypercyanescence. A hypocyanescent halo (partial or complete) around the CNV was seen in all eyes. OCTA could detect and demonstrate the morphology of the CNV complex in all seven cases (100%). Both the B-scan and en face images of OCTA were evaluated. The flow seen on the B-scan helped in better characterization of the level of the abnormal flow in relation to the retinal pigment epithelium (RPE). All the cases included in our study had type 2 membranes based on FA and OCT findings. The network of vessels was easily and clearly seen on the en face scans segmented above the RPE in all cases (Figures 1 and 2). A hypointense halo around the CNV was seen in six out of seven eyes. (a) (Top) Fundus photograph of Patient 1 showing a cream-colored, sickle-shaped lesion at the macula, with an optical coherence tomography (OCT) scan (bottom) through the fovea showing a hyperintense reflective area in the outer retina adjacent to the fovea. (b) Fluorescein angiography image showing hyperfluorescence within the area of the suspected choroidal neovascularization. (c) Indocyanine green angiography showing a lacy network of vessels at the fovea surrounded by a hypocyanescent halo. (d) OCT angiography (OCTA) images segmented through the deep retina showing the same network of vessels more clearly at higher magnification. Inset shows the segmentation level on the OCTA B-scan image. (e) Post-treatment OCTA images showing a significant reduction in size of the lesion (> 50%) with lack of recognition of the individual vessels (“marked resolution”). Inset shows the segmentation level on the OCTA B-scan image. (a) (Top) Fundus photograph of Patient 2 showing a cream-colored oval lesion at the macula with surrounding subretinal fluid, with an optical coherence tomography (OCT) scan (bottom) through the fovea showing a hyperintense reflective area in the outer retina at the fovea with subretinal fluid. (b) Fluorescein angiography image showing hyperfluorescence within the area of the suspected choroidal neovascularization (CNV). (c) Indocyanine green angiography (ICGA) showing an oval hypercyanescent area at the fovea surrounded by a hypocyanescent halo. Few individual vessels of the CNV can be identified on ICGA. (d) OCT angiography (OCTA) images segmented through the deep retina showing the same network of vessels more clearly at higher magnification. Inset shows the segmentation level on the OCTA B-scan image. (e) Post-treatment OCTA images showing a significant reduction in size of the lesion (> 50%), yet some of the individual vessels can still be recognized (“moderate resolution”). Inset shows the segmentation level on the OCTA B-scan image. (a) (Top) Fundus photograph of Patient 6 showing a cream-colored lesion with a grey border at the macula with adjacent subretinal bleed, with an optical coherence tomography (OCT) scan (bottom) showing a hyperintense reflective area in the outer retina at the fovea with subretinal fluid. (b) Fluorescein angiography image showing a large area of hyperfluorescence within the area of the suspected choroidal neovascularization (CNV). (c) Indocyanine green angiography showing multiple networks of fine branching vessels comprising the CNV. (d) OCT angiography (OCTA) images segmented through the deep retina showing the same network of vessels more clearly at higher magnification. Inset shows the segmentation level on the OCTA B-scan image. (e) Post-treatment OCTA images showing a minimal reduction in the size of the lesion (less than 50%) and the individual vessels of the network can still be made out (“mild resolution”). Inset shows the segmentation level on the OCTA B-scan image. The VA of five out of seven patients improved following an intravitreal injection of an anti-VEGF agent. The remaining two had a pre-intervention VA of 20/20 with the primary complaint being metamorphopsia, which showed subjective resolution after the injection of an anti-VEGF agent. The mean logMAR VA improved from 0.55 to 0.27. Based on our qualitative assessment criterion as described in the Patients and Methods section, three of seven eyes showed a marked resolution, three of seven eyes showed moderate resolution, and one of seven eyes showed mild resolution on OCTA. 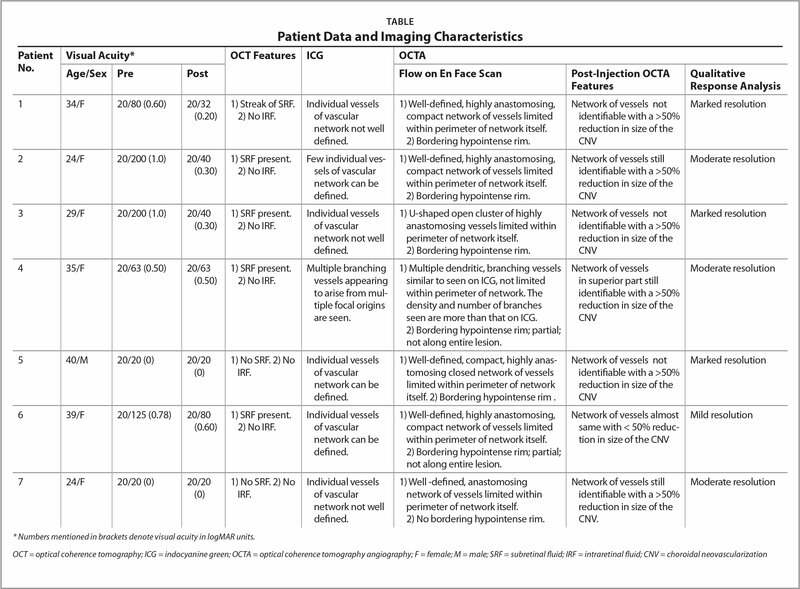 Patient data and imaging characteristics of individual patients are summarized in the Table. Idiopathic CNV is suspected in young patients who present with a subretinal hemorrhage at the macula with an adjacent yellow / grey area. Common causes of secondary CNV are trauma, pathological myopia, choroiditis,5 ocular histoplasmosis, macular dystrophies, parafoveal telangiectasia,6 and angioid streaks.7 In the absence of any of the above or any other ophthalmoscopic disease or abnormality known to be associated with CNV, these may be classified as idiopathic CNV. Typically, the confirmation of the diagnosis is done by FA, which demonstrates a well-defined zone of hyperfluorescence starting from the early phase that increases with time, progressing to leakage in the late phase. The exact morphology of the vessels may not be made out on FA. However, traditionally in the presence of the above fundus features, this has been considered as enough presumptive evidence for diagnosing CNV. OCT generally shows an area of increased reflectivity in the deep retina with or without the presence of SRF and IRF. Multimodal imaging has enhanced our ability to visualize these abnormal neovascular networks and make a more definite diagnosis rather than a presumptive one. Our study showed that the definite network of vessels of idiopathic choroidal neovascularization could be easily identified by OCTA in all the cases (100%) in a noninvasive manner. The FA in all of these cases did show an area of early hyperfluorescence that increased with time; however, it failed to clearly show the neovascular network. ICG, on the other hand, being more protein-bound and less leaky, even through neovascular networks, did show the morphology of the vessels of the CNV in four out of seven (57%) cases. In the remaining three, a diagnosis of CNV could also be established on ICG based on the hypercyanescence seen in the area of the presumed membrane, but a well-defined network of vessels could not be visualized. ICG is an expensive and invasive investigation and may not be routinely available in all ophthalmic setups. On OCTA, we could easily get a more magnified and clearer view of the neovascular network comprising the CNV. OCT alone only showed an area of increased reflectivity in the deep retina. In the absence of subretinal / intraretinal fluid, it is difficult to make a definite diagnosis of an active CNV based on fundus findings and OCT alone. The decision to treat a CNV, however, must be made by correlating OCTA findings with the history, symptoms, and VA of the patient and not just the imaging findings. Response to anti-VEGF treatment was seen in all cases, with the mean VA improving from 0.55 to 0.27 logMAR units at 3 to 4 weeks. At 3 to 4 weeks following an anti-VEGF injection, some amount of regression of the neovascular network was seen on OCTA in all cases. We did not do a quantitative analysis of the CNV as the SS-OCTA used by us lacks software to quantify flow. Quantification of flow software is available in certain OCTA machines, and there are some custom ways of performing the same using software like ImageJ (National Institutes of Health, Bethesda, MD), which use image binarization techniques.8 These techniques are not yet fully standardized, and it is difficult to comment on the scientific validity of what they actually measure. Thus, we did a qualitative analysis of the regression seen on OCTA in the manner described in materials and methods. According to these parameters, three out of seven cases showed a marked regression, three out of seven cases showed a moderate regression, and one out of seven cases showed mild resolution of the CNV. Perhaps a larger series with a longer follow-up can establish the utility of such qualitative parameters in deciding the need for re-injection in such cases. 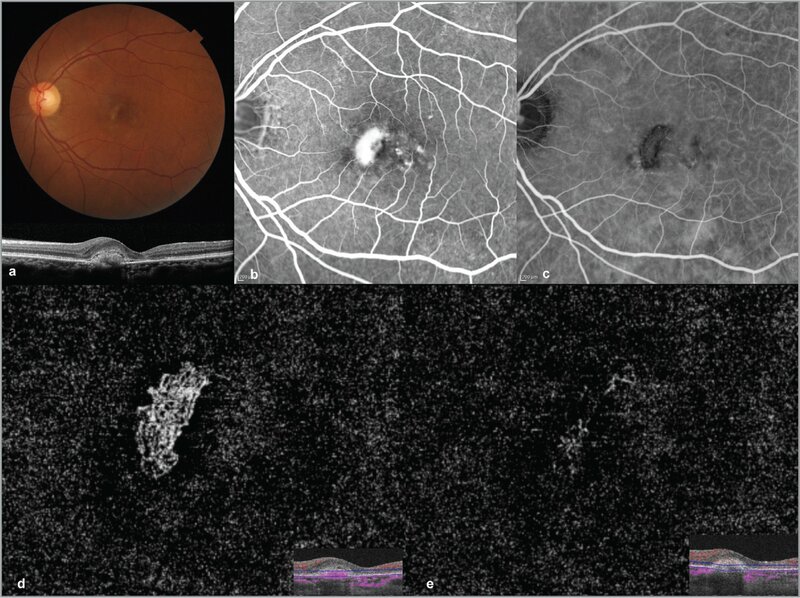 Also, a redevelopment or re-enlargement of the vascular network on OCTA could be taken as an indication of reinjection of anti-VEGF agents even in the absence of a clinically evident fresh fundus hemorrhage, fall in VA, or new fluid on OCT. The small number of cases is a limitation of our study. Lack of long-term follow-up data of these membranes following multiple anti-VEGF injections is also a lacuna. The average age of our cases is 32.1 years. Thus, our results are primarily applicable to cases of type 2 iCNV seen in young patients. We feel that OCTA would prove to be a good tool for detection and follow up of iCNV even in older patients. This would, however, require further validation. A previous study by Qin Chen et al.10 on the application of OCTA in idiopathic CNV primarily aimed at assessing the therapeutic effect of anti-VEGF agents in such cases concluded that OCTA is a useful tool for monitoring and evaluating the treatment effects of intravitreal anti-VEGF. In this study, a comparison between OCTA and FA / ICG was not performed. 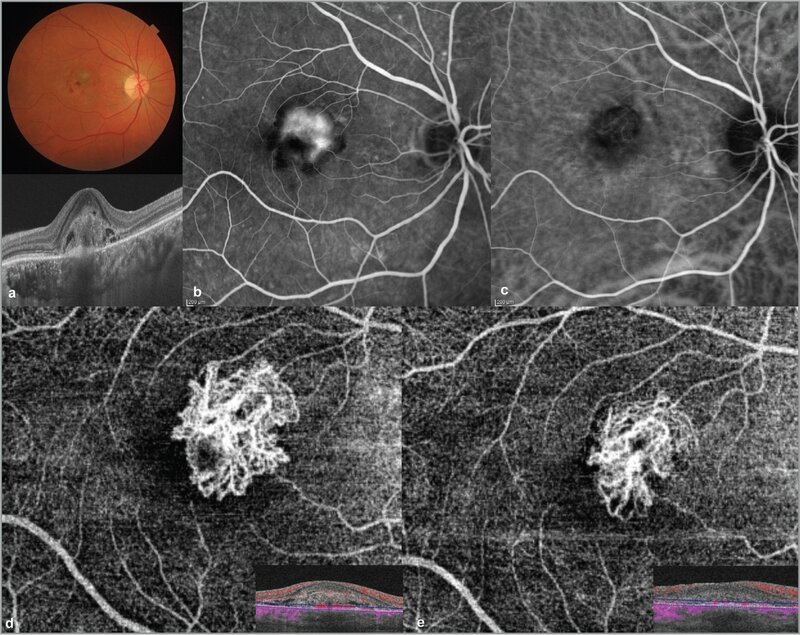 Another study on five cases of idiopathic CNV by Liu et al.11 showed OCTA to be useful. The authors of this study used company developed quantification software. The reliability, repeatability and actual meaning of the parameters measured by such software programs is not yet fully established. Thus, in our study, we propose qualitative norms on OCTA to assess the response of the CNV to therapy. Studies of type 2 CNV in cases of AMD have revealed medusa-head or glomerulus-like12 membranes or membranes with a distinct central trunk with multiple branches.13 Such membranes also show regression in size following ranibizumab (Lucentis; Genentech, South San Francisco, CA) injection.13 However, the regression is not as marked as is seen in our series. The marked regression in our cases is in concordance with the good clinical response and lesser need for repeated anti-VEGF injections seen in cases of iCNV. The membranes seen in our cases were highly anastomosing; however, they were much more compact and limited in extent and limited to one plane. Based on the data available, we conclude that OCTA is a very useful, noninvasive tool to detect, characterize, and follow-up on cases of suspected idiopathic CNV. It may one day replace conventional dye-based angiography techniques as the gold standard for such cases. Schachat A, Wilkinson C, Hinton D, Sadda SR, Wiedemann P. Ryan's Retina. 6th ed. New York City, NY: Elsevier; 2017. From Dr. Rajendra Prasad Centre for Ophthalmic Sciences, All India Institute of Medical Sciences, New Delhi. Address correspondence to Rohan Chawla, MD, Dr. Rajendra Prasad Centre for Ophthalmic Sciences, AIIMS Campus, Aurobindo Marg, Ansari Nagar, New Delhi, Delhi 110029, India; email: dr.rohanrpc@gmail.com.